One of the most common mistakes we see from inexperienced traders is 'fiddling about'. Far too many think that they need to be forever tweaking their positions, when the best course of action is usually to do nothing. I had a trade this evening in Scotland which didn't go to plan at first, but rather than feeling the need to lay this and back that, I was patient and waited for the right times to take action. There are times when football trades simply go wrong and you have to take a loss. ​No-one on this planet makes a profit every time, but successful traders know when to increase liability in the hope of recovering some money, or accept that it's going to end red and move on. In the end it was a fantastic profit and 250% ROI. Here's how my trade panned out. After banking a profit of £110.35 yesterday, I looked through the fixtures for this evening to see if I could spot any trading opportunities. There was nothing standing out to me in England or France, then I looked at the Scottish Premiership fixtures. Team Stats showed me that St Johnstone played above their overall league position of 5th in almost every category, whereas Rangers largely played below their overall 3rd position at home. Digging a little further, I saw that St Johnstone had lost to Celtic this season, but drawn at all of the other top four teams; Aberdeen 0-0, Hearts 2-2 and Rangers 1-1. 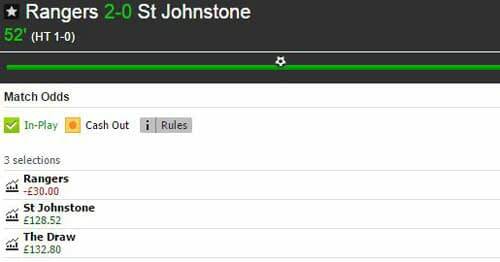 I was quite surprised to find that I could back St Johnstone to win at 6.00 and the draw at 4.30. It seemed that - as per usual - Rangers had been backed down with little regard to their actual probability of winning the game; not at all uncommon with big teams. With an away underdog I had no intention of risking too much, nor did I need to with such big prices. 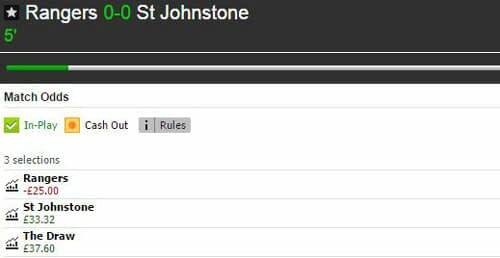 I backed St Johnstone to win at 6.00 (£10) and the draw at 4.30 (£15). Of course, I didn't need an away win at full-time in order to profit from backing St Johnstone, but they had scored first at Rangers earlier in the season and led 1-2 at Hearts. A 0-0 draw would have been fine too! I left the first half to run, setting up Flashscores on my phone so I could pop back to the computer and take out some liability if it went 0-1. Unfortunately for me though, Rangers took the lead on 22'. I sat on my hands and did nothing (except continue to watch TV) because an equaliser would put me back into a profitable position. At this point, many would have layed Rangers or layed 1-0 in the 'half-time score' market on Betfair, but there really wasn't a need to do a thing. An equaliser would have already been great for me, so no need to increase my liability while my trade was still very much recoverable. The in-play stats favoured the home team at half-time and soon after it was 2-0. Not at all what I wanted! I decided that it was time to take action and layed Rangers at 1.05 (£100). 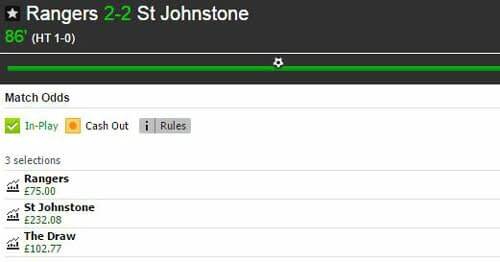 This added just £5 to my initial £25 liability but gave me plenty of green to play with should St Johnstone pull a goal back quickly. I was now in recovery mode and looking for a quick 2-1 so I could scratch the trade. 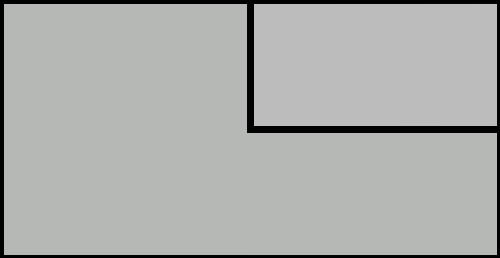 In fact, it took the away side until 74' to get on the scoresheet. I could have reduced my liability to £10, but decided to stay in and lay U3.5 goals instead so that a goal either way would help out. While I was looking at options, Rangers picked up a red card. It was now an easy decision to stay in. I could have layed U3.5 goals, but I couldn't see Rangers doing anything but defend and try to see the game out. Again, I did nothing when others would have felt the need to do something - anything. 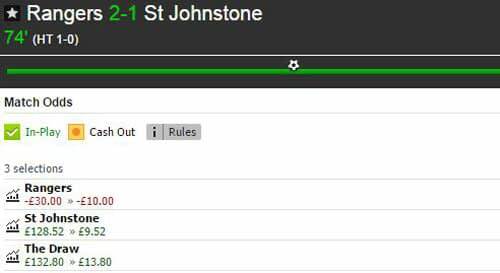 St Johnstone equalised on 87' and I was able to lay the draw, ensuring an excellent profit whatever else happened in the closing minutes. I left more on the draw as I had expected the game to end 2-2, but Rangers had other ideas and scored a winner on 90+1'. Definitely a case of mixed emotions as it cost me £27 profit, but was a first goal at Ibrox for Emerson Hyndman (on loan from Bournemouth) so I wasn't too unhappy, being a Bournemouth fan! I ended up with £75 profit from my £30 liability and a massive 250% ROI. I'll take that any day of the week and it was all thanks to Team Stats (plus some patience when things went wrong).